Government New ideas and beliefs can challenge a government's authority, leading to change. 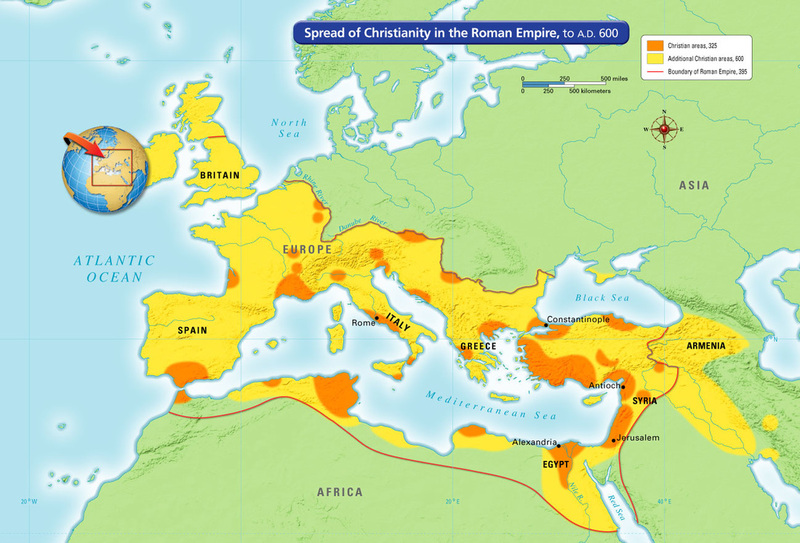 The Romans were in general tolerant of the religious beliefs of people they ruled. However, they did expect the people to worship the emperor and to allow temples to be built to Roman gods. Jews and Christians were unwilling to do either. This unwillingness caused conflict with Rome. Background: Fire! In A.D. 64, wind swept flames across the Circus Maximus, Rome's huge racing arena. Afterward, much of the city lay in ruins. 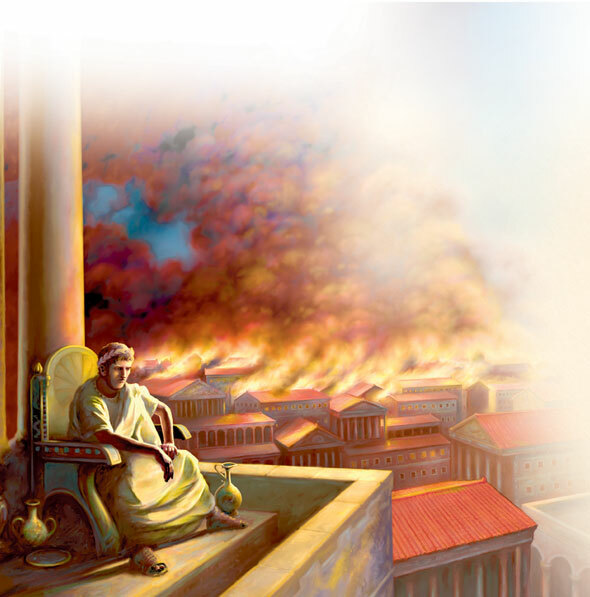 A nasty rumor about Rome's emperor, Nero, began to spread almost as fast as the fire had. People whispered that the unpopular emperor had set the fire so that he could rebuild Rome, including a grand new palace. The emperor said that the unpopular Christians had started the fire. But not all Romans blamed the Christians, as you will read. The baker is opening his shop near Rome's Christian neighborhood. Every morning, Christians come to buy bread at his bakery. Some Romans hate the Christians because they keep to themselves and refuse to worship the Roman gods. It's true that they don't go to the theater and the races and their men don't join the army. They're also poor, and they wear old clothes. But they're good neighbors and good customers. The Christians the baker knows would never start a fire. The baker was lucky. His shop still smells smoky, but at least it didn't burn in the fire. As he sets things back in order, he feels sad that his Christian customers suffered so terribly. Because they were unpopular, they were easy for the emperor to blame. To stop people from saying that he set the fire, Nero told everyone it was the fault of the Christians. The baker has heard that hundreds of Christians who survived the fire died terrible deaths afterward. At Nero's order, many were burned, while others were hanged on crosses or ripped apart by dogs. Nero conducted these executions right in his gardens. The public was invited, but the baker was too disgusted to go. It's difficult for the baker to understand the Christians' religion. Even so, he doesn't believe any group should suffer such an awful punishment. He wonders whether the Christians who survived will be too afraid to come back to buy his bread. Cross - The cross is a symbol of Christianity. 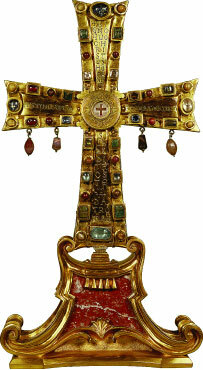 Some crosses are simple objects made of wood. Some are made of gold and adorned with jewels, like the one shown above. Build on What You Know Religion plays an important role in many people's lives, perhaps your own as well as others'. A new religion called Christianity grew out of Jewish beliefs and the ideas of a Jewish teacher named Jesus. ESSENTIAL QUESTION How did Christianity build on Jewish beliefs about the future? In 63 B.C., the Romans conquered the Jewish kingdom of Judah, also called Judea. Although the Jews had their own kings, these Jewish rulers had to be approved by Rome. During their history, the Jews had frequently been treated badly. Many wanted to be delivered from oppression and from foreign rulers. Some Jewish sacred writings promised a Messiah. Some people believed that this would be an earthly ruler sent by God. However, there were many different Jewish opinions about what to expect from a Messiah. Some believed that this ruler would be descended from King David, the ruler of Israel in the 900s B.C. Some Jews believed the Messiah would free them. 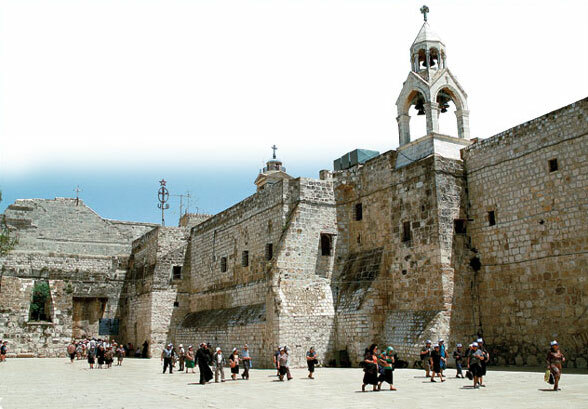 Bethlehem - This photograph shows the Church of the Nativity in Bethlehem, supposedly built upon the site of Jesus' birth. The building to the right is a monastery. ESSENTIAL QUESTION Who did the disciples of Jesus believe he was? As a Jew born in the Roman province of Judea, Jesus followed many of the teachings of Judaism. However, he also taught certain ideas and practices that differed from what others were teaching. We know about Jesus from four accounts called the Gospels, written after his death by Matthew, Mark, Luke, and John. 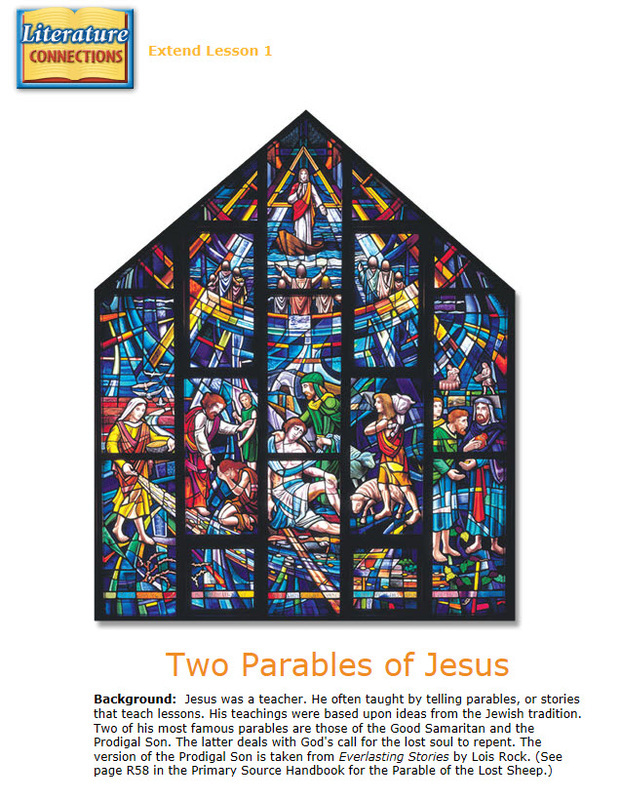 The Gospels and other writings make up the New Testament. According to the Gospels, Jesus was born in Bethlehem and grew up in Nazareth. Christians would later celebrate his birth on the holiday of Christmas. In the Gospel account, Jesus was raised by Mary and by Joseph, a carpenter. As a young adult, Jesus became a traveling teacher. Biblical accounts say he cured the sick and lame and performed other miracles, such as turning water to wine. Jesus began to gather followers. His closest followers were called disciples. Jesus' 12 disciples were Peter, Andrew, James, John, Philip, Bartholomew, Thomas, Matthew, James (son of Alphaeus), Simon, Thaddaeus, and Judas Iscariot. Jesus preached justice, compassion, and the coming of God's kingdom. He often delivered these messages in the form of parables, or stories with morals. 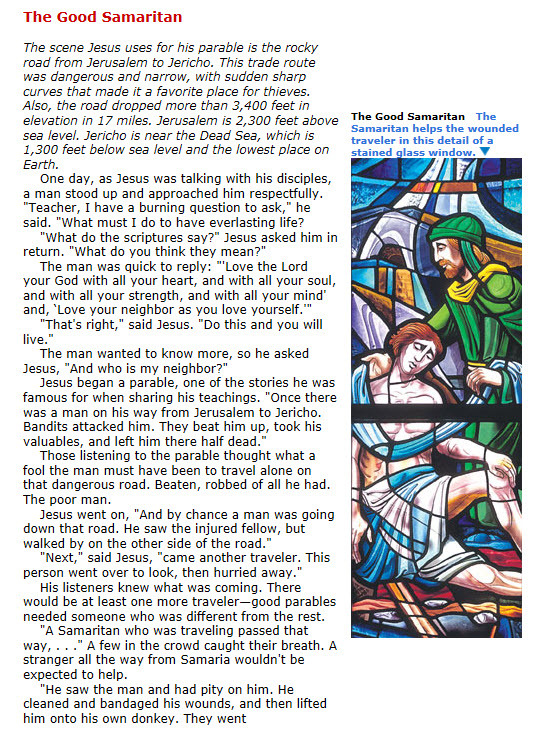 Three of Jesus' best-known parables are those of the Good Samaritan, the Prodigal Son, and the Lost Sheep. 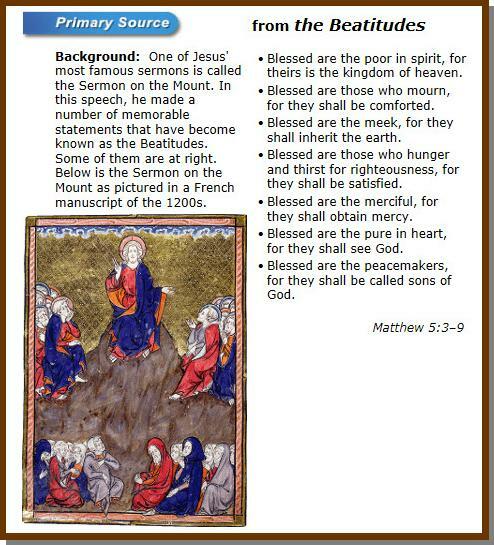 Jesus' most famous teachings were given in the Sermon on the Mount. The sermon opens with the Beatitudes (bee•AT•ih•TOODZ), or blessings. In this sermon, Jesus encouraged people not only to obey the law but also to change their hearts. People shouldn't simply refrain from killing; they should also love and pray for their enemies. 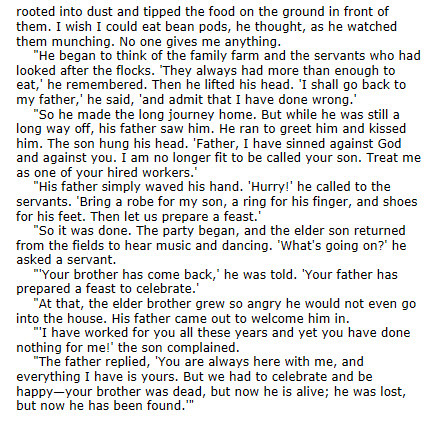 Jesus encouraged his followers to live simply and humbly. Despite his teachings, Jesus angered some people who heard him preach. For example, Jesus forgave people who had broken religious laws, but many Jewish leaders thought only God could grant this kind of forgiveness. Jesus also associated with sinners, whom religious leaders treated as outcasts. Most shocking was the claim of some of Jesus' followers that he was the Messiah they had long been waiting for. ESSENTIAL QUESTION What belief about Jesus did Christians think made an afterlife possible? The claim that Jesus was the Messiah, or Jewish liberator and ruler, threatened the Romans because it questioned their political power and authority. The claim also shocked many Jewish leaders. According to three of the Gospels, Jesus' followers hailed him as king when he journeyed to Jerusalem to celebrate the Jewish holy day of Passover. In that city's holy Temple, Jesus publicly criticized how the Temple was being run. Jesus was arrested and turned over to the Romans for punishment. These public challenges to Rome and Jewish authorities appointed by Rome sealed his fate. Jewish leaders arrested Jesus and turned him over to the Romans for punishment. The Roman governor, Pontius Pilate, ordered Jesus to be executed by crucifixion, or hanging on a cross until he suffocated. After Jesus died, a huge stone was placed in front of the tomb where he was buried. On the third day after his execution, according to the Gospels, some of his followers reported that the stone had moved and the tomb lay empty. Others said they had seen Jesus and had even walked and talked with him. These accounts of Jesus' resurrection, or return to life, proved to many of his followers that he was divine. They came to believe that Jesus had been willing to give up his own life for the sake of God's kingdom. Through his death and resurrection, God was bringing new life into the world. This was a world in which sin would no longer prevail and even death would be defeated. Jesus' followers said anyone who believed this would share in the life of God. 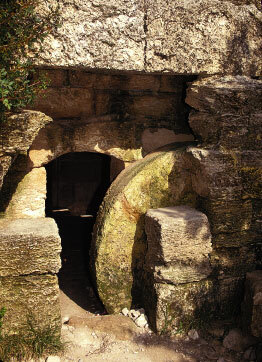 Tomb - This burial chamber dating from the time of Jesus was sealed with a round stone. According to Christians, Jesus' crucifixion took place on a Friday, and his resurrection on a Sunday. The Christian holidays Good Friday and Easter Sunday, which recall these two events, have been celebrated ever since. Relief Sculpture - The fish is a Christian symbol dating from ancient times. 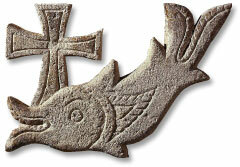 This fourth-century fish with a cross is from a Christian cemetery in Egypt. Some Jews believed a Messiah would give them political power and religious freedom. 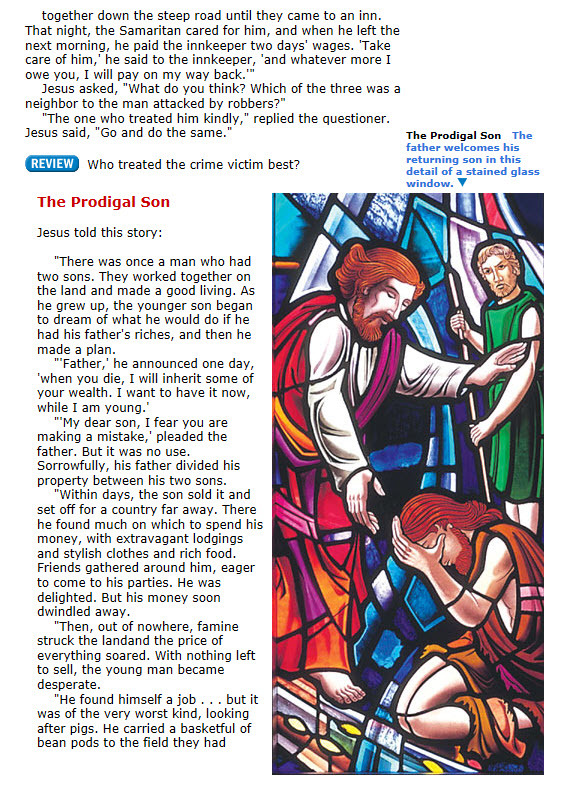 Jesus' teachings stressed compassion, justice, and the coming of God's kingdom. Accounts of Jesus' resurrection made some people believe Jesus was divine. Jesus and his earliest followers were Jewish. Eventually, however, more and more non-Jews converted to Christianity. Today about a third of the people in the world are Christians.